Ulster University, Belfast for Animation with Hunger by Matt McDyre, Scott Gill, Daniel Boyle, Hannah Loughridge and Hannah Turkington, sponsored by Performance Film and Media Insurance. Ulster University also picked up a highly commended award in this category for To The Moon by Gianni Francesco De Giuseppe, Rhea Hanlon, Phillip McDowell and Ryan Beatty. Stellify Media sponsored the Comedy and Entertainment category and the winner was Take It From Me by Meghan Mc Ardle, Nathan Stevenson, Ewan Beckett and Orla Finucane from Ulster University Magee with Train of Thought by Tomas Clawson, Chris Curran from Belfast Metropolitan College highly commended. In Drama, sponsored by Westway Films the honours went to Queens University for Beast by Alex Harper; Ryan Early, Holly Croman, Sean Dorris and Skaiste Gotseldaite. Highly commended also went to Queens University for Red Brick City by Mark McNally, James McBrien, Ryan Campbell, Darragh McCaughey and Ryan Humphreys. The Factual award, sponsored by Crawford McCann went to Nomad by Zoe Tweedy and Joshua McGonigle from Queens University who also picked up the new Craft award recognising particular skill in camera work for their production, sponsored by UTV. Young Carers by Caitlin Knox from Northern Regional College was highly commended in the factual category. Kieran Doherty, Chair of RTS NI who studied at the Belfast Institute of Further and Higher Education said: “As an educational charity these awards help the RTS to raise awareness of the amazing home-grown talent emerging from our third level colleges. This year’s entries all displayed very high standards of creativity, innovation and technical capability and I know the judges had a difficult task selecting our winners, I trust these awards will assist all the students in their future careers. 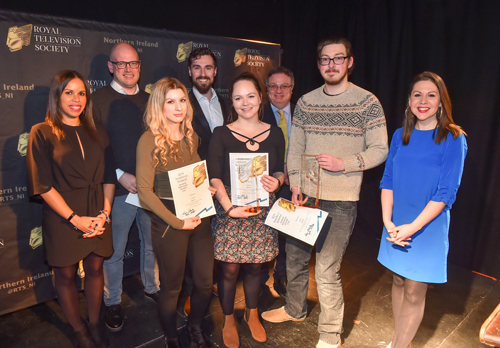 Supported by the Department for Communities as part of Creativity Month, the RTS NI Student Television Awards recognise the importance of education within the growing creative industry sector in Northern Ireland. The winners of these Awards go forward to the national RTS Student Media Awards which will be held in London later this year.